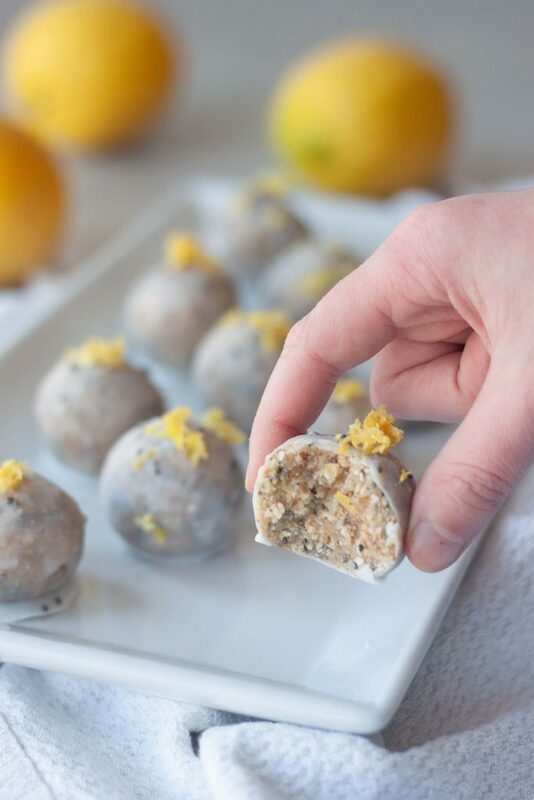 Summers here, sun is shining, and we’re enjoying No Bake Lemon Chia Coconut Glazed Donut Holes! Or maybe we should call them DoNOT holes, hmm. Breakfast or snack they’re a great grab and go that doesn’t require turning the oven on with this heat. This Friday is National Donut Day but we don’t need to wait for a special day to enjoy these or any donuts. I was never a donut fan until a couple years ago when it was our family foodie theme for the year. Every month we went to a new donut shop and got at least a dozen donuts and had fun as a family trying them all. Even our Christmas cards that year were taken at one of our favorite local donut shops. That year I found my love for donuts that my family had. 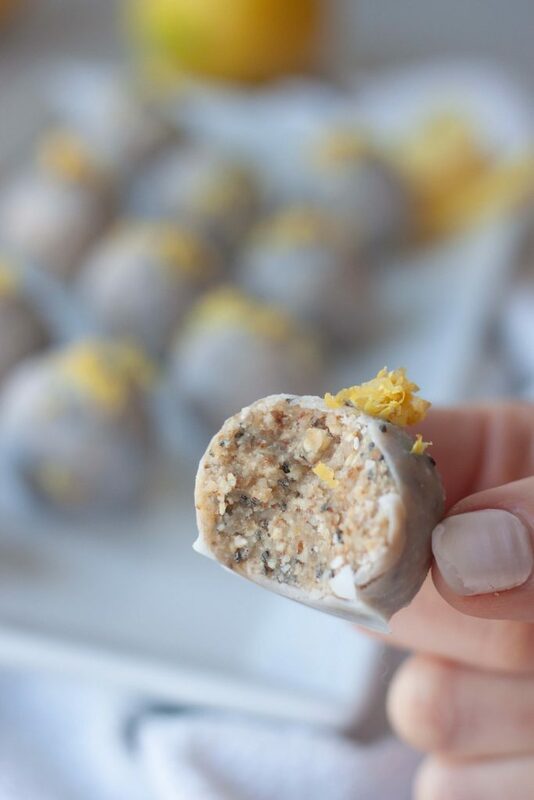 I’ve always loved healthy snacks and when A spent the day with me back in April while her sister was in school Alison Wu shared some Lemon Poppy No Bake Donut Holes and instantly A said we had to make a version so we headed to the kitchen and that’s just what we did! For A it was love at lemon for me it was the coconut, and for both it was everything rolled into these fresh glazed bites! Her sister being “chia obsessed” she thought that she’d like them for a snack when she got home from school that day. No Bake Lemon Chia Coconut Glazed Donut Holes are a fresh and delicious healthy treat that can be enjoyed for breakfast, snack, or dessert! Gluten free and vegan friendly they’re packed with good for you nutrition, healthy fats, and flavor that’s both satisfying and filling. So many healthy ingredients packed into these bites made this mama’s heart happy, not to mention spend time with A in the kitchen like we did when she was younger before she went to school. I miss those days so much some days. The girls still have just over a week of school left but I’m one of the mama’s that’s happy about the girls being home for the summer. Although we will be leaving right away for S’s out of state soccer tournament followed by a family vacation. 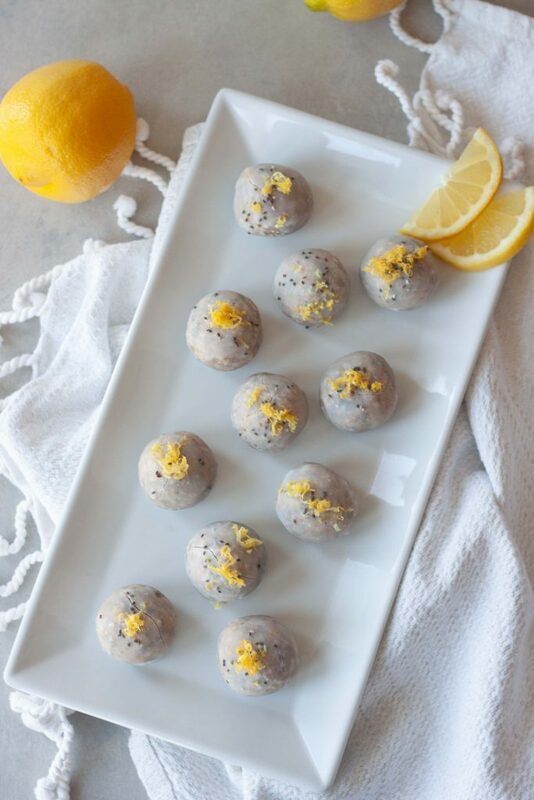 I really wish we could take some No Bake Lemon Chia Coconut Glazed Donut Holes with on our trip next week as much as I love traveling with healthy snacks and these would be perfect for a pre soccer snack for S or for us to enjoy on our hike they wouldn’t handle the heat well. Just as a glazed donut melts and gets a little messy when it gets warm. Finger licking good I know but we’ll just enjoy them while we can before we leave and I have some stashed in the freezer for when we get back. 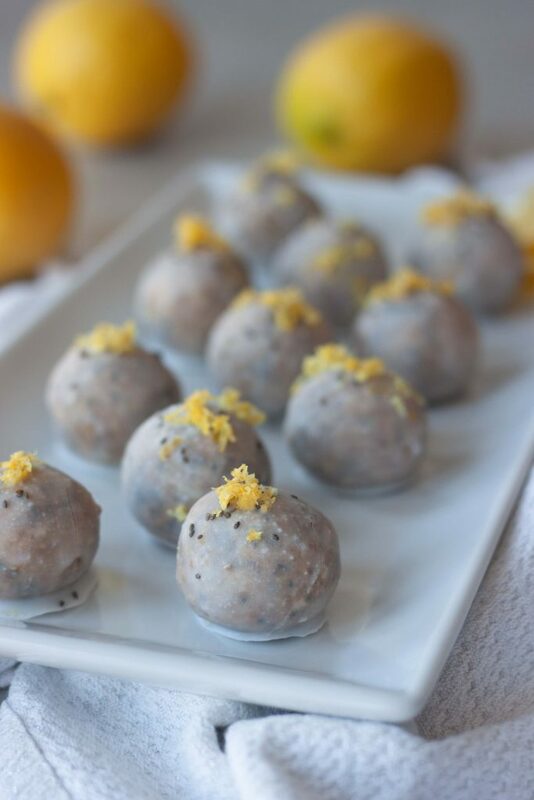 These first caught my attention, aside from A wanting them which again I’m thinking was because she loves lemons, was that they were a cross between and energy bite and fat ball, like I had been making all of last year adding in oats or muesli to fat balls as they were a perfect snack for me and just what I needed and craved. Packed with healthy fats, carbs, omegas, and other whole food nutrition to keep this mama fueled as well as the girls for their gymnastics, dance, and soccer! 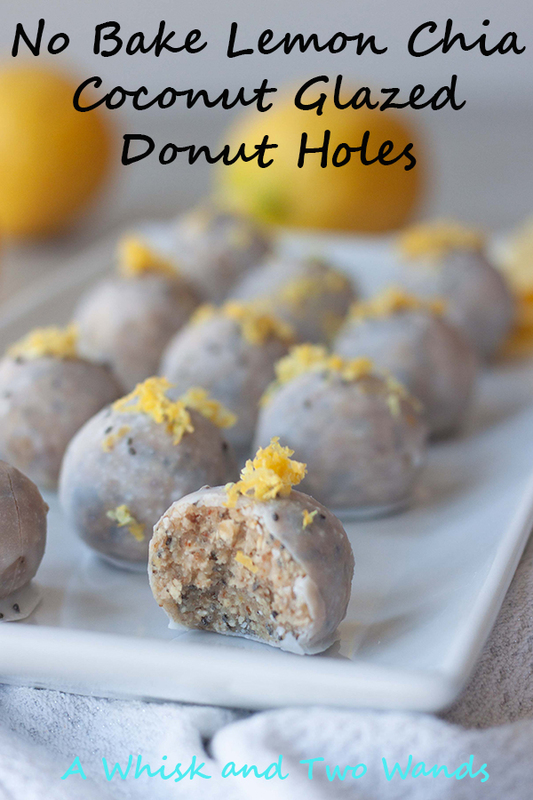 The kids can’t keep their hands off No Bake Lemon Chia Coconut Glazed Donut Holes either! Like these or looking for something with a only a handful of ingredients? Check out these other no bake lemon treats Lemon Berry Chia Coconut Bliss Bites and Purple Pride Blueberry Bliss Bites! 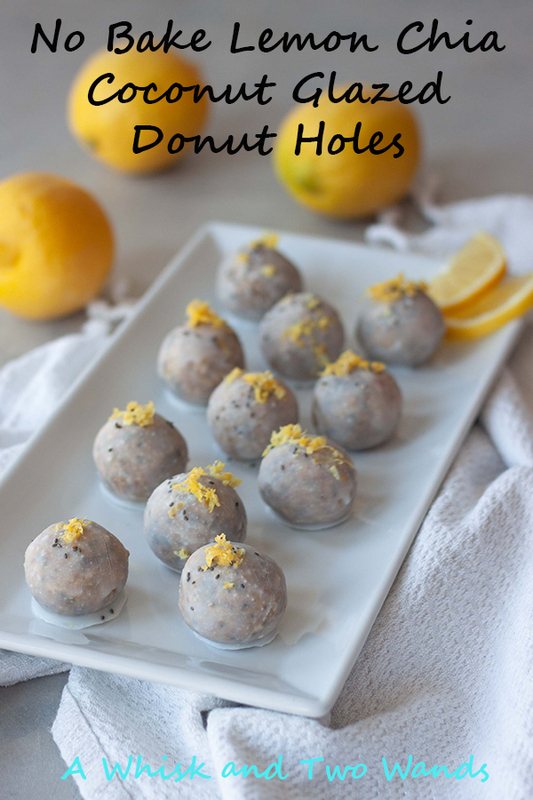 No Bake Lemon Chia Coconut Glazed Donut Holes are the perfect treat for when life gives you lemons! Lemon Donut Holes with a coconut butter glaze they melt in your mouth and make you say mmm as your worries melt away! No Bake Lemon Chia Coconut Glazed Donut Holes are a fresh and delicious healthy treat that can be enjoyed for breakfast, snack, or dessert! Lemon Donut Holes with a coconut butter glaze they melt in your mouth and make you say mmm! Gluten free and vegan they're packed with good for you nutrition, healthy fats, and flavor that's both satisfying and filling. Add oats, almonds, and dates to a food processor and pulse for a good 30-45 seconds. Add in vanilla, coconut butter, coconut oil, sweetener, salt, zest and juice from lemons and process until dough forms and all ingredients are well mixed. Sprinkle in chia seeds and pulse a few times until well combined. The dough will be wet and sticky. Roll into 24 balls, or desired size, and place on a parchment paper lined plate and freeze for about an hour until firm (our most recent batch took 30 minutes). If the dough is too sticky to roll place in the refrigerator for 15 minutes and then roll into balls. Once the balls have set and are firm, make the glaze. In a small bowl mix melted coconut oil and coconut butter together. Dip each ball (donut hole) into the glaze and roll until fully coated and return to a parchment lined plate. Quickly sprinkle with chia seeds and or lemon zest if desired. The glaze hardens almost immediately since the donuts are cold. If the glaze doesn’t harden because climate is too warm, place the donuts back into the freezer to harden. Once set we store ours in the refrigerator and pull them from there to enjoy!